Two of the biggest risks when using a ladder are from ladder movement during use. If the ladder is not secured at the bottom, there can be a risk of the ladder feet sliding away from the wall rapidly and the user falling with it. As well as the risk of injury on impact with the floor, any tools or heavy equipment will also fall and could land on the user, causing further injury. There are several ways this can be avoided. Inspect your ladder – Before use always check your ladder for any signs of wear or damage and if any are detected make sure they are corrected before work commences. Check the floor surface – Firstly, make sure the ground where the ladder is to be sited is free of loose debris. Clear any water, snow, ice or oil away and ensure the surface is level and capable of supporting the weight of the ladder. Levelling mats – If uneven or sloping ground cannot be avoided, a levelling mat can be employed. These consist of four non-slip rubber mats that are placed under the feet of the ladder and adjusted in height to give a level base. Depending on what surface you’re erecting your ladder upon, you may want to consider other ladder accessories such as a grass/decking gripper. Ladder anchor – A ladder anchor has two parts, the anchor eye and a ladder safety strap (also known as a ladder tensioning strap). The anchor eye is a thick metal bolt with a round eye at one end and an adjustable metal sleeve around the thread of the bolt. The bolt is secured by drilling a hole of the right dimensions for the bolt and sleeve into the wall below the damp course. Angle the hole slightly downwards so any water that collects in the hole will run out. Tap the bolt into the hole with the sleeve on until the whole sleeve is in the hole. The bolt can then be tightened, causing the sleeve to expand and grip the inside of the hole securely. The safety strap can then be threaded through the eye of the bolt until an equal length of strap lies on either side of the eye. At either end of the strap there will be a loop of the fabric or a clip that will attach to the leg of the ladder below the bottom rung. Once these are attached to both legs of the ladder the base of the ladder is pulled away from the wall until the strap is taut. The base of the ladder is now securely attached to the wall and can move no further away due to the tension in the strap. Make sure the strap is the correct length to ensure the ladder is at the correct angle to the wall. It is possible to make your own strap from rope or webbing with a loop tied at either end, but care must be taken to ensure the rope and knots are strong enough to take the weight of the ladder and results in the ladder being at the correct angle. Ladders should always be erected at a 4:1 angle. The easiest ladder angle calculator is to measure the height the top of the ladder will be during work and divide by four. This will give the distance the base of the ladder should be from the wall. Ladder stabiliser – Any good extension ladder will come supplied with an integral stabiliser bar. This fits to the base of the ladder and increases the footprint in contact with the floor, giving added grip. When working at the top of a ladder the greatest risk is from lateral movement, usually caused by the user leaning out and causing the ladder to slip sideways. Although ladders should never be used in strong windy conditions, even light winds from the side can catch the user off guard, tipping the ladder over. If a ladder is to be left erected in windy conditions, the top should always be secured to minimise the risk of damage to the ladder or surrounding property and to avoid injury to others working below. Tying to the structure – If possible, tie the ladder to the structure it is resting on using rope or wire or ideally using a ladder tie off strap similar to securing with a ladder anchor. Always secure the ladder to a solid piece of the structure, not to drainpipes or guttering that will be unable to support the weight and could cause further damage in case of slippage. Using a ladder anchor – for added security a ladder anchor can be used I a similar way to securing the base. Again, use a drill to make a hole of the correct width and depth, angled slightly downwards to prevent water build up in the hole. Insert the anchor eye and tap into place then tighten to secure the sleeve. The ladder can now be tied to the eye, or ideally be secured with a ladder safety lanyard. This is by far the safest and most secure way of tying the top of the ladder. 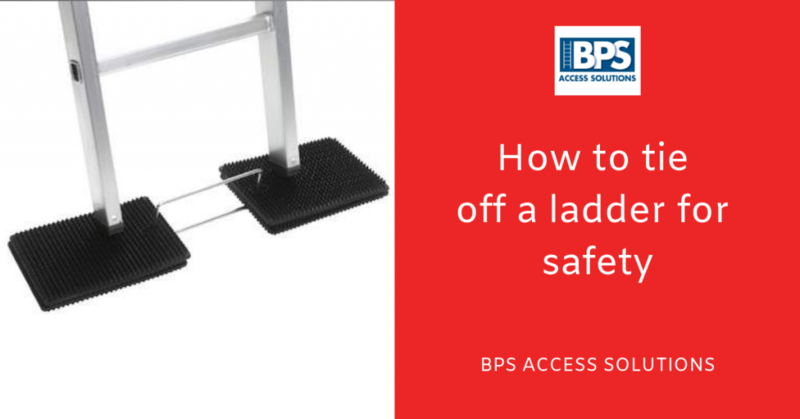 At BPS Access Solutions we have a wide range of ladders and accessories to suit all requirements and guarantee safety and quality for the lowest price. We check our prices daily against our competitors to ensure the best deal for our customers and all products come with a free no quibble lifetime guarantee. We offer free next day delivery and all products are rigorously tested to conform to the latest safety standards. Please visit our website for further information or call our friendly and helpful expert staff who will be happy to answer any queries.